Bim Group designs, manages and supports custom employee benefit plans for a diverse set of clients with a variety of needs and differing priorities. We understand that benefits and insurance are complicated and ever-evolving. Therefore, we diligently maintain our knowledge of the current laws and industry best practices, and pair this knowledge with a laser-sharp understanding of each client’s concerns (e.g., budgetary restrictions, affordable healthcare, top benefits for employees, communication with employees, and process efficiencies, etc.). We make it easy for employers to sustain an employee benefit plan that is an integral component of an employee’s total compensation. With a local focus, we are personally responsive. Bim Group is unmatched in its utilization of tools and resources in combination with the broad bench strength of consultants, underwriters, analysts, and account management teams to execute your employee benefit strategy—whether you have 50 or 5,000 employees. We are experts at executing complex project management including identifying cost reduction opportunities, building reliable budgets, and reporting financial/clinical data. Our planning and design resources support informed and objective executive decisions for any size employer. The 212° Workforce Solution is our proprietary and proven planning process that assures employer clients that their vision will be executed and achieved. The Workforce Solution is comprised of four steps resulting in a customized benefits blueprint. This includes the completion of a questionnaire, a discovery session, analysis of and reflection on information gleaned from the questionnaire and discussion, and a presentation of a step-by-step, multi-year plan delineating a path to achieving your company’s vision. Identifying and mitigating health risks within an employee population, which results in reduced utilization and savings, is easy to articulate but difficult to execute…without the expertise of BIM Group. Forward-thinking employers who embrace population health management (PHM) as an economic business decision drastically impact employee health care consumption. Bim Group’s PHM strategies benefit employers that aspire to gain control over the cost of employee health care. A critical success factor of any employee benefit plan is implementing strategies to ensure employees understand and value the benefits their employer provides. Recognizing the various learning styles of employees from baby boomers to millennials, our communication and graphic design teams distribute robust, dynamic communication resources. 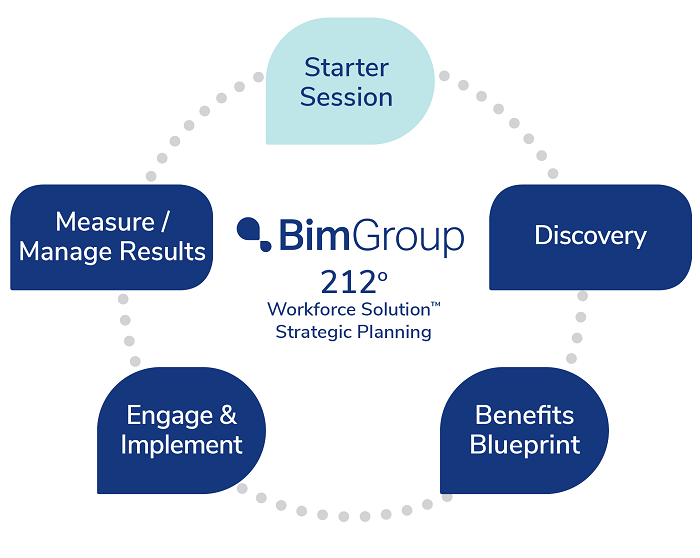 Bim Group is committed to making employee benefits easy to implement and administer while affording HR professionals the opportunity to focus on their core responsibilities. Our HR advocacy resources are designed to support executive leadership decisions regarding benefits in tandem with providing employees with an exceptional benefit experience year-round. ERISA, ACA, FMLA, COBRA, HIPAA, GINA, ADA, FLSA and the list goes on. Many employers are unaware of the full scope of responsibilities necessary for compliance with federal regulations for health and welfare plans. Adherence to regulations protects the client from fines, keeps employees informed, and creates a strong foundation for the health and welfare plan. Bim Group ensures compliance obligations have been streamlined for maximum efficiency. We do not provide legal advice, but with a dedicated Director of Compliance, we offer education, recommend next actions, and connect clients with partners to address vulnerability gaps. Bim Group prides itself on timely communication, relevant webinars, and a client compliance portal housing past webinar recordings, white papers, and articles are readily available to clients. When the needs of clients are beyond our scope of knowledge, our UBA partnership provides external points of contact with specialized legal counsel to facilitate discussions.